Did you know remote sensing goes extra-terrestrial? 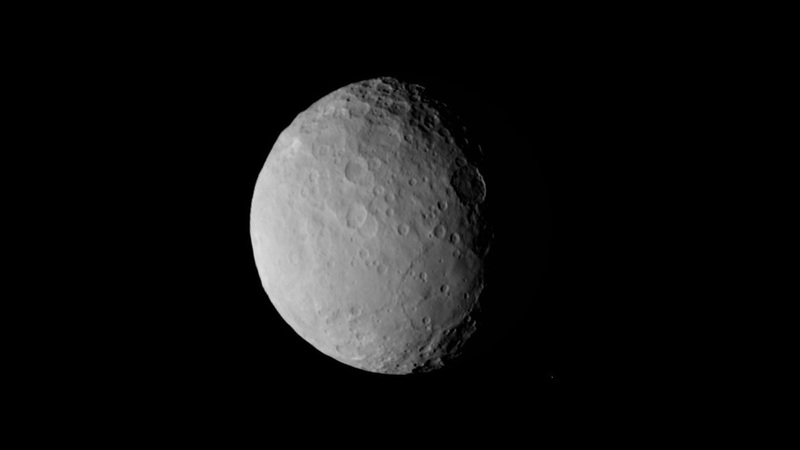 Ceres captured by NASA’s Dawn spacecraft on 19 Feb 2015. If you didn’t realise remote sensing of other planets and space objects occurs, you’re not alone. Remote sensing is playing an important role in helping us understand how our planet, and our universe, was created; however this isn’t celebrated much outside, or even within, the remote sensing community. We discussed this topic when ESA’s Rosetta arrived at Comet 67P, and it surfaced again last week when NASA’s Dawn spacecraft went into orbit around the dwarf planet, Ceres, which lies 38 000 miles away, between Mars and Jupiter. Dawn’s mission is to study Ceres and the asteroid Vesta, which it orbited during 2011 and 2012, to develop our understanding of early solar system formation. There was a lot of media attention about Dawn’s arrival at Ceres, as it’s the first spacecraft to visit a dwarf planet and also the first to orbit two different non-earth objects. The technical and engineering feat to get Dawn to Vesta and Ceres is amazing, but the science to acquire, and interpret, the data is pure remote sensing. However, you rarely see it described as such within the headlines. A camera, designed by the Max Planck Institute for Solar System Research in Germany, which will provide both three colour and panchromatic images, and when it descends into a low orbit around Ceres it will offer 62m spatial resolution. It can use 7 different colour filters, detect near-infrared energy and has an 8 gigabyte internal memory. As the camera is vital to both the navigation, and the science, side of the mission, Dawn carries two identical, but physically separate, versions. A Visible and Infrared Mapping Spectrometer (VIR-MS) designed and built by Galileo Avionica in Italy to provide surface maps. The instrument has a high spectral resolution of between 0.25 – 1µm in the visible light range, and 0.95 – 5µm in infrared, and has 6 gigabits of internal memory. Interestingly, it was based on the VIRTIS instrument carried by Rosetta to map Comet 67P. Gamma Ray and Neutron Detector (GRaND) — The instrument has 21 sensors, a wide field of view and produces maps of Ceres measuring the rock forming elements, trace elements, radioactive elements as well as Hydrogen, Carbon and Nitrogen. It was developed by the Los Alamos National Laboratory in the United States, and unlike the other two instruments has no internal storage. Supporting these instrument measurements will be various radiometric and navigational data to help determine the gravitational field. The fundamental principles of remote sensing – measuring the reflected energy of the planet to determine what is on the surface – is right at the heart of Dawn’s mission. So why isn’t the remote sensing community shouting more about it? We’re probably as guilty as everyone else here; we refer to Pixalytics as either a remote sensing company and/or an Earth observation company. Is it this association to Earth, which means we don’t always acknowledge the work, and achievements, beyond our planet? Remote sensing is leading the way in enhancing knowledge about how the universe began; this is our scientific field that is helping make this possible. So let’s make some noise for the remote sensing community, elbow the space engineers out of the way to get ourselves into the news and let everybody else know what remote sensing can do! This entry was posted in Earth Observation, ESA, NASA, Remote Sensing, Understanding Space and tagged camera, Ceres, Comet 67/P, Dawn, Earth Observation, ESA, extra-terrestrial, GRaND, instruements, NASA, pixalytics, remote sensing, Rosetta, spectrometer, Vesta, VIR by Andy. Bookmark the permalink.